Nostalgic: A shrine for Space Butler. Welcome to Nostalgic, a character shrine dedicated to Space Butler from the anime series, Quack Experimental Anime: Excel Saga! "Why is Space Butler so important?" you may ask. 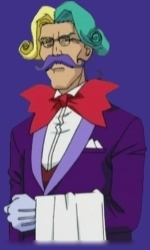 Space Butler had lots to do with the series, even if he only appeared in one episode. It was because of this heroic butler from space that Hyatt ever arrived on Earth. "Why make a shrine for him anyways?" you may ask. Well, after his heroic actions, I thought Space Butler deserved at least one shrine of his own. He's very truthful, and would never let a few cute fiends stop him from keeping a promise to a friend. I hope you enjoy this website. - Webmaster, Abraham Chinchilla Jr. This website was opened on July 9, 2002. Quack Experimental Anime: Excel Saga & Space Butler © Koshi Rikdo/Shonen Gahosha, Victor Entertainment, & ADV Films. Nostalgic Site Content and Edited Graphics © 2002-03 Abraham Chinchilla Jr.